This is going to sound really odd and I may be the only person to offer this sentiment, but I think the brown/red color combination is largely under used. It’s very hard to think of a team or program that utilizes this color scheme (well, there is another on this list, and they’ve landed themselves a pretty respectable ranking). Having said that, the Brown Bears land themselves at No. 40. I’m not sure what exactly it is about these that I like, or even dislike, but they have a character of their own. The one thing they did well is utilize the branded “Brown” wordmark well. 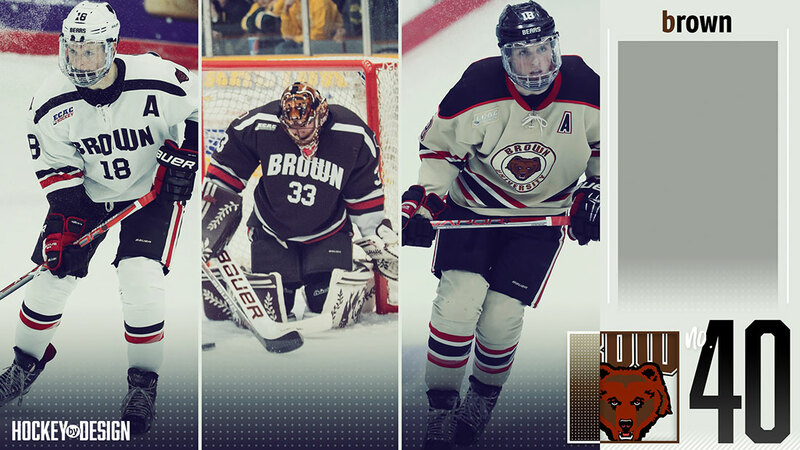 To my knowledge, this is the wordmark the Bears use across the board, and more times than not, hockey jerseys can go off and do their own thing and skew from the university athletic department brand. I really appreciate how Brown incorporated this look into their uniform. When your school name is Brown, you might as well own it, right? To my knowledge, the Bears were only one of two teams to have an all brown uniform (do you know who the other was? ), and of the three, these resonate with me the most. The red and white matching piping on the sleeves and bottom of the uniform offer a nice pop and the cleanliness of the white wordmark and number is equally as strong. I firmly believe that when red is moderately used with brown, it has a profound effect. The white uniform is nice as well, essentially a flipped version of the brown one. I’m not necessarily crazy about the shoulder piping on either of these models, but the bear logo placed in between the two shoulder yokes is a great addition. The beige uniforms are not my favorite. I’m not a big fan of a big honkin’ circle mark on the front of a jersey and there is just too much colored striping going on here. If these beige jerseys were of the same model of the brown or whites, I would be swooning. The plain brown shoulder covering with the red-piping outline is way too much for me, as well. There’s few places that have the charm of Gutterson Fieldhouse, situated smackdab in the middle of Burlington, Vermont…but unfortunately, the Catamounts uniforms have a bit to be desired given how strong their color combination and passionate fanbase is. I have Vermont at No. 39 because like I said before, I don’t dislike really anything about GroovyUV’s get up – there just isn’t too much that stands out to me. UVM has gone through a bunch of different variations over the years and have offered up some fantastic third alternates, including a very cool ‘UVM’ one a couple years back, but to my knowledge, these were the mainstays in 2016-17. Branded well? Absolutely. Collegiate looking? Sure. If I had to pick between the two, I’d go with the green offerings – mainly because I don’t particularly care for the boxey shoulder look on the whites. I think the top of the green uniform is clean and I appreciate that Vermont has embraced how complicated its main logo is and has not stretched it out to go full bore on the front. It makes for a perfect accompanying mark on the pants / shoulders / etc. 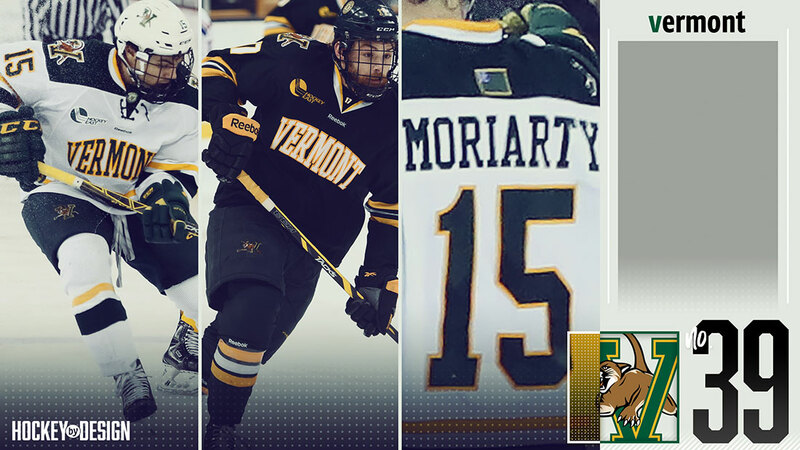 The one random aspect of these uniforms I also appreciate is the length of the wordmark and the fact that Vermont did not feel it had to brandish a number below it. I feel as if that were the case, it would have been way too much to look at on the front. It’s also worth noting that the white and green uniforms have both a different piping consistency and number font which I’m more than fine with and think both hold their own. The number font on the green uniform has been UVM’s brand for some time and I’ve always been a fan of that bubbly, long look. And lastly, the Catamounts added the Vermont state flag (pictured very poorly on the right) just above the last name on the back of the uniform which I think is a great touch. Any time you can incorporate little details like that without going over the top will always go over well with the fans and student-athletes as well as instilling a sense of pride in the fan base. Black and orange is a very tough color combination to beat and the Tigers do a nice job with everything here. I know that a few years ago, Princeton used its famous crest, which now sits as a shoulder patch, as it’s primary marking on the front. As an Ivy, I think that’s a look Princeton should have maintained, but that’s not for me to decide. I appreciate the simplicity of this uniform and how the Tigers have maintained its distinguishable logo on the shoulder. Between the whites and the blacks, I think the all-black Princeton uniform is a very nice look. I’ve always thought all black uniforms are a nice contrast on the ice, obviously when skating on an all white surface. The orange accents are strong, yet subtle, and I believe it goes a long way. 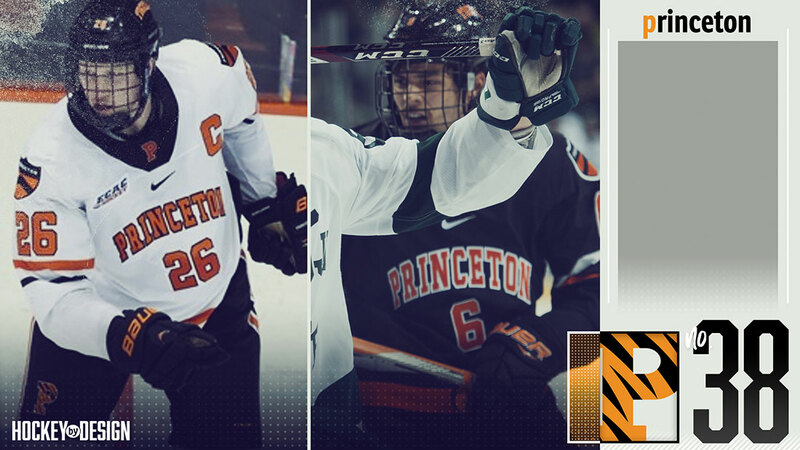 I appreciate the tiger-striped Princeton “P” is situated on the hockey pants, but which that the same marking was applied on the v-neck collar bumper. From this pictured here, it seems like PU just went with a plain-orange P stroked in white. All in all, nothing too outlandish with these or anything too memorable, but this is a nice-looking outfit that holds its own with some of the higher-ranked threads. I’m going to try and stick to sports on these North Dakota uniforms. As many may be aware, there’s been some turmoil in Grand Forks over the usage of the ‘Sioux’ marking. I think it’s fair to say that the North Dakota hockey fan base may one of the most passionate and well-versed groups in the game, if not the most. As someone who was in Tampa when UND won its eighth national title in Tampa in 2016, the entire city was painted green. Having said that, not a single one of North Dakota’s fans had on one of the two uniforms depicted here. They all fashioned the old Sioux jersey that embodied that program for so long. 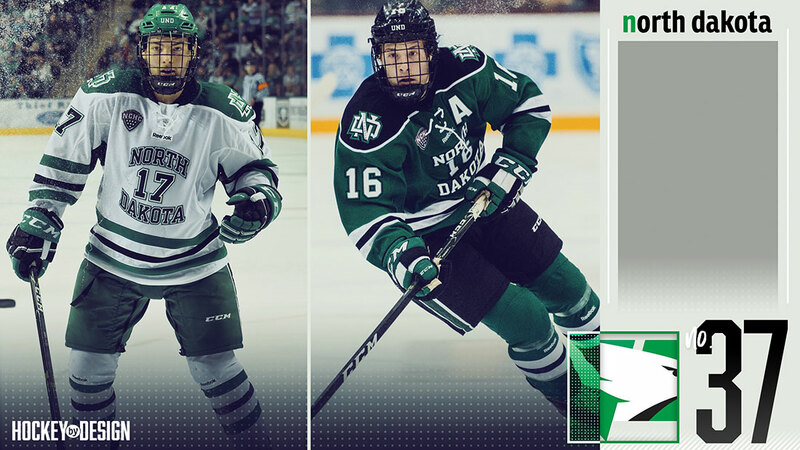 Having said that, it was hard for me to place North Dakota this low given the tradition and history of the program, but the new uniforms UND sports are really nothing that great. Again, we’re treading a thin line and we don’t want to get too political here, but I feel as if NoDak was very conservative in its branding efforts, at least on its hockey uniform. North Dakota, now referred to as the Fighting Hawks, under went an entire new brand identity with the change over but nowhere on the uniforms do you see the new logo…and that’s okay! I just find it a bit odd. Simply put, it’s an arched ‘North’ on top – number – arched ‘Dakota’ on the front and that’s about it. They sport a very easy to decipher name and number scheme, accompanied by a very strong color scheme. UND has its unique interlocking ND on the shoulder, but I’m not a big fan of what it’s encompassed in, on either outfit. The half-oval shoulder yokes, even though a classic look, just aren’t my favorite. The green and white piping are a bit different on both sets, but consistent throughout. North Dakota was a hard one because of how much has changed and how the fan base has not seemed to embrace it just yet. A good-looking uniform that I’m certain will be tweaked and perfect in the coming years. We’ve been in a bit of a funk where teams have been offering similar-looking uniforms, just flipping the color swatches essentially. Well, the Miami breaks that trend with pretty different looking getups at No. 36. Let’s start from left to right, or better yet, my favorite to least favorite. I think the Redhawks’ initial uniform is definitely their sharpest, cleanest and most concise. I know I said earlier how I thought the shoulder swatches were too boxey on Vermont’s white uniform. For whatever reason, I think they look much better here on Miami’s ensemble. The spacing between where the red shoulder patch ends, the sleeve number and the stripes on the sleeve are very well executed. The wordmark and number on the front are the perfect size and very crisp. The Miami ‘M’ is the perfect accompanying mark for the pants and helmet and that’s very much where they’re affixed here. I also believe these are more of an off-white, cream colored look which I think is something that’s very under utilized in the game. The red uniform is extremely clean. It’s a great-looking college hockey uniform with consistent piping throughout. 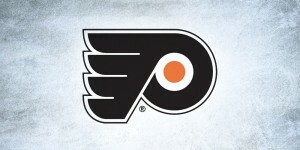 The two-toned, double stroked wordmark looks nice, but I would like to see how it might look without that extra stroke. It’s a little bit busy to look at, but it’s unique and think it works well here. 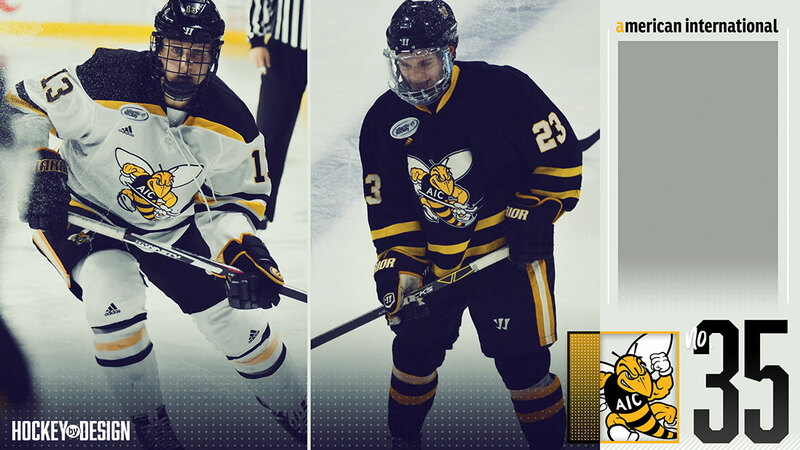 The third jersey, with the ‘M’ logo on the front, harkens back to the Merrimack review. The logo is fine, but might not be best served enlarged on the front. 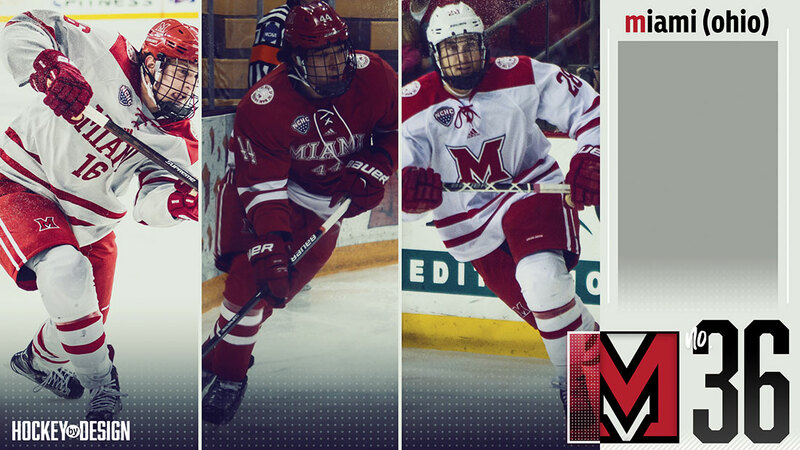 Lastly, my favorite element Miami (Ohio) sports on all three jerseys is “The Seal of The Miami University” logo on the shoulder. It’s a nice, unique touch that Miami can call its own. Ahh, those pesky Yellow Jackets. Sure, if you’re not a college hockey fan and you don’t live in New England, you might not know exactly what American International is. In regards to the overall aesthetic of these uniforms, there’s really nothing that’s extraordinary. The striping and overall look is pretty generic and I’m even going against one of my rules of “would anyone know who this team was if they’ve never seen them play before?” Unfortunately, probably not…but this gimmick has one me over. It’s extremely collegiate looking and from a logo design standpoint, it’s the perfect type of logo to largely place on the front of a hockey jersey. Again, people might not know what “AIC” stands for, but I think that even AIC might be okay with that. The logo makes the uniform and sometimes, that’s just enough. Bravo for being bold with these, AIC. 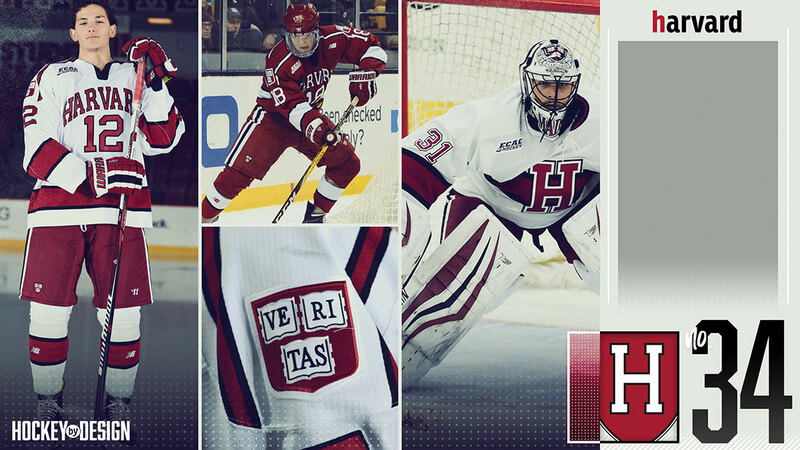 We’ll stay in New England and tackle the first of the four Beanpot schools as the Crimson of Harvard weigh in at No. 34. On Harvard’s three getups, there’s both a lot to like and a couple things I’d maybe change up, but as we normally do, let’s start with the positives. Harvard certainly embraces its “mascot”, er, color if you will by going bold with the Crimson look, on both its home and away offerings. The thick, crimson band stroked with two black stripes on both the lower arm sleeve, lower part of the sweater and socks are a strong, common theme, but with so much horizontal going on, I wish that Harvard would reduce some of the piping on the pants. The thick, vertical look of the two white stripes with a black line going down the middle makes it a bit much to look at. Even a thin, white stripe might suffice here. As we’ve spoken about before, Harvard’s variety of shoulder yoke isn’t necessarily my style, but it is unique. But, with another three-stripe offering on the shoulders now yields even more clutter. Along those lines, the front number is rather large and would possibly benefit from getting knocked down a couple font sizes. 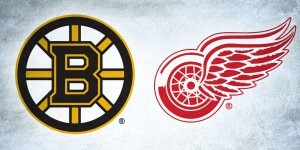 What stands out most notably to me is that Ve-Ri-Tas patch on both home and away sweaters. It is the embodiment of one the world’s most prestigious universities and am pleased it has made its way onto the pant and the shoulder. The Harvard “arms”, as it’s known, is the decorative version of the University seal, which remains a legal device for authenticating documents. Some variant of the arms can be seen anywhere on campus. It’s the saving grace of the uniform and goes a long way to keep Harvard this high in the rankings. The Crimson’s third jersey is a nice variation from the other two, despite the ‘H’ on the front having a bit of a blocky effect. The number scheme on it is sharp though, and on all three uniforms, there’s no question who’s in town when the Crimson step onto the ice. Many may balk at this unconventional uniform (the darks, anyways), but our friends in Marquette, Michigan weigh in at No. 33. I think it’s fair to quickly comment on the white sweaters and overall look and decipher that the Wildcats’ look emanates what the New York Rangers have going on with the similar shoulder striping and vertical team name with the heavily accented drop shadow. (I, for one, love the Rangers uniforms, so these are a nice, classic look for me). But let’s get to the greens…what the hell is that NMU mark shoved in the lower left corner? I’ll tell you what it is. It’s (a) something you’re not going to see on any other college sweater, giving it big-time bonus points (b) something Northern Michigan has been practicing for awhile (c) so different and out there that I love it. This would be a top-20 look for me if the green jerseys did not have that awful white piping down the sides. I don’t understand those lines as they offers nothing of value other than cluttering up an already somewhat busy front of a jersey. 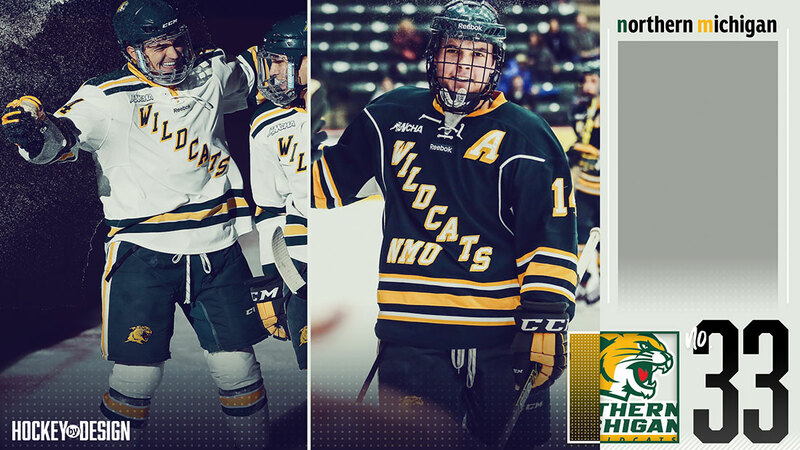 If you get rid of those white lines, the double-striped piping with that quirky ‘NMU’ mark mushing into the slanted Wildcats’ mark would be a one of a kind sweater. I give Northern Michigan here points for doing something different and keeping historical look front and center (or, not so center…) on their sweaters. Denver offers up another prime example of an exact replica of home and away kits, but once again, an inverted color swap. Some might say, ‘there’s nothing to these!’ and that may be so, but the overall cleanliness and collegiate look of the Pios’ uniforms are very strong. I believe Denver utilized its markings very well as the ‘DU’ logo on the shoulder is a perfectly placed emblem. I also believe that if you don’t need to tinker with shoulder striping, don’t. More times than not, it can make matters worse. I’m of the ‘less is more’ school when it comes to uniforms. Be selective in what you offer and Denver has done just that. 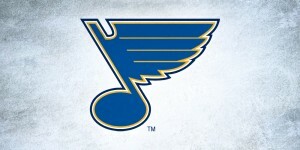 The front wordmark on the jersey extends a tad bit too wide, but I’m not going to gripe about that. I would have also liked to see the ‘DU’ logo on the pants. 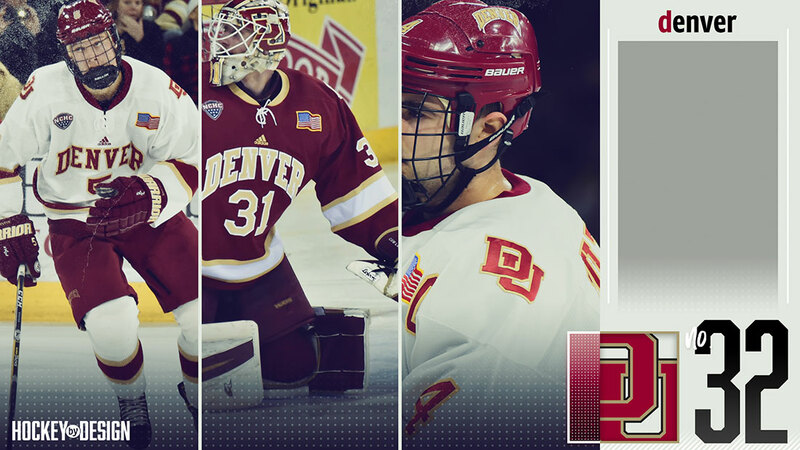 The smaller Denver wordmark works great on the helmet and sweater, but it’s hard to make out on the pants. The consistent thin-thick-thin striping combo throughout is aesthetically pleasing and I’m a big fan of the American flag on the uniform. If I’m not mistaken, this is the first I’ve seen so far. Again, I wish Adidas didn’t have to insert itself into the equation with that terribly-placed logo, but I also understand you don’t have much control over what the manufacturer provides. 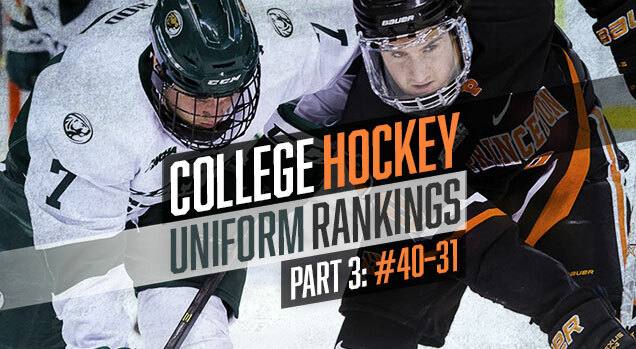 The color brown inserts itself once again into the college hockey uniform rankings equation with a program that has the name green in it! 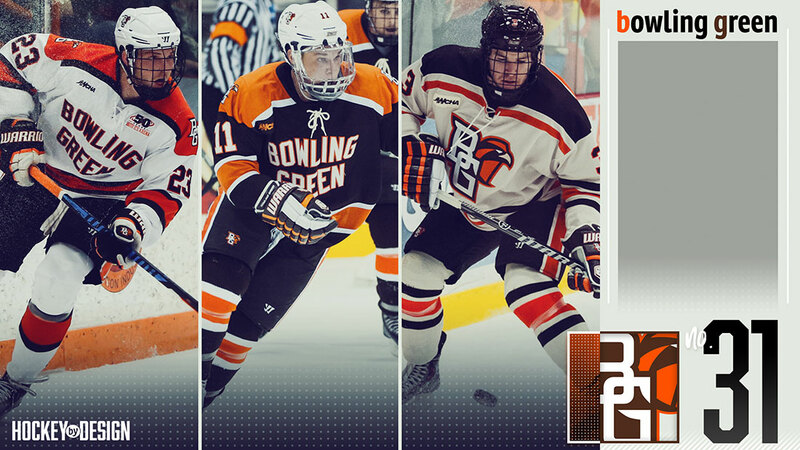 But alas, the Bowling Green Falcons provide a unique perspective that goes bold with its color scheme, landing it just one slot out of the top echelon of college hockey threads. The arm striping and bold, legible number just above it look just fine. What stands out to me, particularly on the whites, is the unique shoulder yoke where the main inside color extends beyond the piping. I keep going back and forth in my head if I enjoy that or not – I certainly appreciate the uniqueness of it and think that the ‘BG’ logo with the Falcon alongside of it is the perfect shoulder emblem. At least according to these pictures here, it seems to me that the orange in these uniforms is a little different and I wish there was a bit more consistency there. I’m a huge fan of the orange boldness on the whites and would like to see that put into effect on the brown getups. The cream-color uniforms are a thing of beauty…except for one thing – that huge logo on the front! I get it. That’s Bowling Green’s main logo, so what’s the problem with it being there? For me, it’s another case of one of those logos you don’t want to expand to make the front of your sweater look like a sandwich board. They’re perfect accompanying marks for a college hockey uniform. Although I appreciate they deviated from the look of the home and away uniforms to try something different, I just wish that logo wasn’t so huge. Lastly, as just one small thing I noticed, I love little details like they have on the gloves. That’s where the logo is, as well, and those are places better served for it! I just think things like that are a nice touch. I disagree with a lot of your opinions, but am loving this series! Thank you! The flag on the back of the UVM jerseys is not the state flag, it is the regimental standard of the “Green Mountain Boys” – the nickname of the Vermont troops who fought in the American Revolution and the Civil War. Today it is the insignia of the Vermont National Guard and Air National Guard.